The basic objective of the project is to build an autonomous robot that would guide new students, admits or visitors throughout the campus of their college, university or organization. It would take the students throughout the campus and would tell them about each and every block, specializations offered and the most happening places in campus. We would be using echo to achieve our goal for NLP and OpenCV for object detection and avoidance. WizWiki-W7500 and WIZ750SR are used for authentication and activation purposes. The robot could only be activated using authentic RFID tags and activated based on the result. Also, we would be using a router that would support the data transmission. We would be using the MQTT protocol for distribution of telemetry messages to the client. The RFID tags would also be customized to keep destination centric information which would enable the robot to go to the desired spot. Implementing basic AWS lambda functions along with coding for alexa skill sets. Working on the implementation of AWS SSML and IoT. Implementation of the Node Red and communication using MQTT protocol or through HTTP. Creating the intents for the Alexa Skill sets. Handing the user’s speech recognization and turning it into the tokens identifying the “intents” and any associated contextual parameters. Receiving data values from RFID tags when tapped in RFID reader connected with WizWiki-W7500. 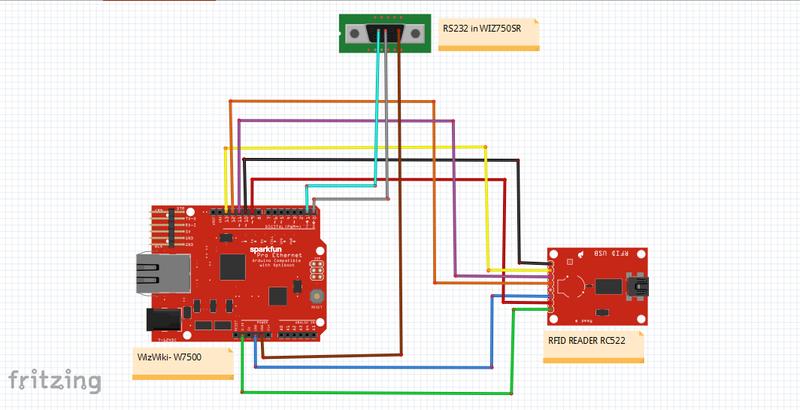 Connecting WIZ750SR with WizWiki-W7500 through RS232 module. Sending data values received on WIZ750SR to remote cloud server ThingSpeak. Making User Interface which will control ECHOTRON wirelessely. 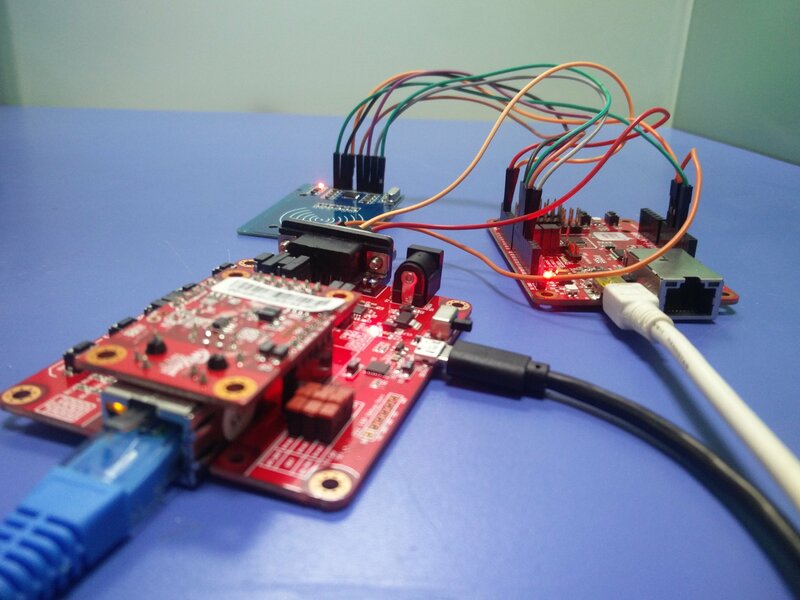 Receiving data from ThingSpeak cloud and getting the value on WIZWIKI-7500 module installed on ECHOTRON. 1 / 3 • Figure 1:- Connection of WIZ750SR and RFID tag reader with WizWiki-W7500. Figure 2:- Values being transferred to ThingSpeak cloud from WIZ750SR module. Figure 3:- User Interface for controlling ECHOTRON wirelessely. Since ECHOTRON is an autonomous robot, computer vision is one of the important component of this project. The ability to see the environment in order to avoid obstacle is basic strategy of this module. Using concepts such as optical flow, sub conversion in order to keep track of obstacle on the way of ECHOTRON. Optical flow is the pattern of apparent motion of image objects between two consecutive frames caused by the movement of object or camera. It is 2D vector field where each vector is a displacement vector showing the movement of points from first frame to second. We will use functions like cv2.calcOpticalFlowPyrLK() to track feature points in a video. 1 / 2 • Figure 4.1:- Object is being detected in the path using Optical Flow. Figure 4.2:- Object is being detected in the path using Optical Flow. "my favorite subject is electronics or computers or electrical"
"my favorite sub is electronics or e.c.e ." "my favorite subject is computers."